In the early days of Cigar Rights of America (CRA), the creation of the organization caused a stir for existing groups, especially the International Premium Cigar & Pipe Retailers Association (IPCPR). While it’s often forgotten now, just days after the announcement of the founding of CRA in 2008, IPCPR moved to start its own organization for consumers. The group, called “Friends of the Industry,” was hastily announced just a day after CRA was unveiled. Manufacturers, who had lined up behind, and provided the initial funding for, CRA were caught off guard by the IPCPR’s seemingly unplanned attempt to copy the CRA. “All the cigar manufacturers are lining up to be part of the CRA, and we invite the IPCPR to join our organization. I think we should work together,” Ashton president Robbie Levine told Cigar Aficionado. Nothing much became of IPCPR’s consumer group, at least not officially. Though the association has (thankfully) made more effort lately to encourage consumers to contact their elected representatives, even if they’ve dropped the “Friends of the Industry” group name. In hindsight this seems to be a good thing. My opinion is informed by being a member of Cigar Rights of America since soon after its founding, and becoming an online media member of the IPCPR last year. Now more than ever I’n glad the CRA was created. Recently, the need for an independent consumer-oriented group has been reinforced by an ongoing controversy over the role of media (and specifically online media like StogieGuys.com) at the IPCPR annual trade show. My intention isn’t to get into that controversy, but if you want to read more I recommend checking out the opinions of Cigar Craig and Jerry of Stogie Review. IPCPR primarily represents two key constituencies: the retailers whose numbers make up most of its ranks and the manufacturers who pay a large percentage of its fees, particularly to be part of the trade show. These are important groups, whose fundamental goals are in line with cigar smokers, especially when it comes to anti-tobacco zealots’ attempts to regulate and tax cigars out of existence. But when it comes to smaller, more internal, issues, cigar consumers’ interests are not always perfectly in line with manufacturers or retailers. The debate over cigar media access to the annual trade show makes this clear. Our readers certainly benefit from our reporting (and that of others) from the trade show, even if some people would prefer a more controlled release of information. That’s part of why the Cigar Rights of America is so fundamental. It represents an increasingly independent voice for consumers and their interests. 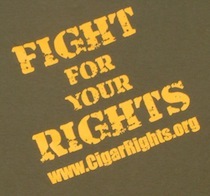 Cigar smokers need to join the CRA, so the organization can effectively represent cigar smokers exclusively. “Industry” voices (both manufacturers and retailers) are important and should be supported. But the pure number of voting cigar smokers is a force they need to counter the anti-tobacco lobby. Join today and be proud that you’re a part of the solution. How will this work until the manufacturers stop being the primary backing and leadership? The CRA board and exec team is comprised of 13 individuals, 10 are manufacturers or retailers. I think it would be great for the CRA to be independent, but is there any realistic way for this to happen? It certainly is an issue. I think the answer is the funding. As long as they get a majority of funding from manufacturers, their interests will take precedent (even though most of the time the interests are the same). Growing the consumer membership is the answer (not exactly an answer anyone doesn't already know). If the Board, no matter who is on it, knows it has to give dues paying members a reason to renew their financial support, that keeps them accountable. And yes, I'd like to see more non-retailers/manufacturers on the board. As a reader who has enjoyed your live coverage of the IPCPR trade show for years, I'm concerned that IPCPR is trying to make it harder for the online cigar community as a whole to attend the event.